In a large bowl mix all your wet ingredients together, the milk, pumpkin, egg, vinegar, and vegetable oil. Set aside you will add Nutella to this in just a bit. In a second large bowl combine your dry ingredients, the flour, brown sugar, baking soda, baking powder, ground allspice, cinnamon, ground ginger, and salt. Add Nutella to the wet ingredients bowl and swirl around. Slowly mix in the wet ingredients into the dry ingredients just enough to combine together. Heat a griddle or pan on medium heat with a little bit of butter. Scoop batter into the pan and flip once pancake become bubbly on top. Serve pancakes hot and with syrup or honey. If we could eat this every single morning throughout the fall months I think we would be pretty content! 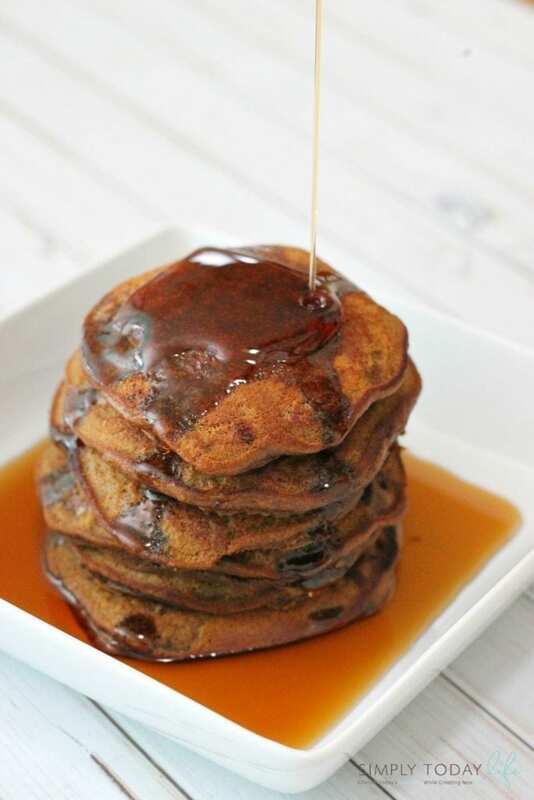 These pancakes turn out so fluffy, soft, and filled with fall flavors. What is your favorite fall breakfast recipe?